STUTTGART -- The economic stimulus programs in industrial and developing countries will yield results later this year, says Robert Bosch CEO Franz Fehrenbach. As the worlds largest auto supplier, Bosch is especially affected by the industry crisis in Europe, the United States and Asia. Bernd Bohr, the head of the companys vehicle technology division, says its automotive business fell 25 percent in the fourth quarter of last year. He is also hoping for positive effects from the German governments stimulus package. But we will not know for six to eight weeks whether the environmental bonus will lead to rising revenues for us as well, he said. Its not a problem for Bosch if Germanys scrapping bonus, which pays cash to consumers who sell a car at least 9 years old and buy a new one, favors the purchase of small cars from foreign brands. 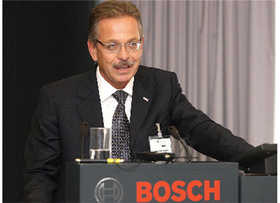 In every car made in Europe, there is an average of 800 euros worth of Bosch technology, Bohr said. Overall, the company fears there will be a painful revenue decline in the first half of the year. It will take great effort to keep our profitability halfway stable at a low level , Fehrenbach said. The year 2008 was not very encouraging for the company. After revenues climbed 5 percent in the first half, they fell 2.8 percent to 45 billion euros for the entire year. The greatest decline was in the vehicle business.